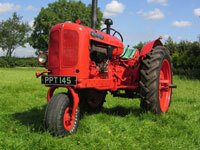 Our Museum is a collection of vintage tractors that started over 60 years ago and is still growing. Our ambition here is to have a good and original example of each Nuffield, Leyland and Marshall model. Most of our tractors are still in their original condition or if not, they have been restored to a very high standard using only genuine parts. It is a private collection and is not open to the general public but you are very welcome to visit by appointment. Built at Ward End Birmingham in 1949, the 1103rd tractor built by Morris Motors. Restored by Martin Littlefair in the 1980's and runs and works as good as the day it came out of the factory. It's not the oldest tractor in our collection but it is our oldest Nuffield tractor. Serial number is M3-NT1604 and registration number PPT145. Based on the ETA type side-valve engine specially developed for tractor use and is 38 horse power. Very original tractor built by Morris Motors. It still drives and runs just as it did when it left the factory at Ward End Birmingham in September 1952. Powered by the Morris Type ETA petrol/TVO four cylinder engine with a maximum rated power of 38 hp at 2000 rpm. It is complete with hydraulics, which wasn't available on the earlier Nuffields and has an extended air cleaner for use in dusty conditions. Serial number NT11459, registration number KSJ 558. 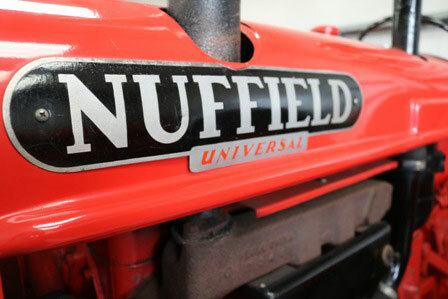 1968 Nuffield 4/65 - Original Condition. This is a very original example of a 4/65. Manufactured at the BMC Scotland Plant in January 1968 and first registered in August 1968. Powered by the BMC 38TD, 4 cylinder, 8 valve diesel engine with a maximum rated power of 65 hp at 2200 rpm. It has spent its entire life here in Lancashire. BMC 3.8 TD 4 cylinder engine; Max engine power 65bhp at 2200 rev/min; Max torque 172 lb/ft at 1350 rev/min - Simms Minimec fuel pump - Mechanical dry disc brakes - Independant hydraulics with draught control and auxiliary services; Max lift 3350 lb- 11" inch dual independant dry clutch - Sliding mesh gearbox; 10 forward gears; 2 reverse gears. 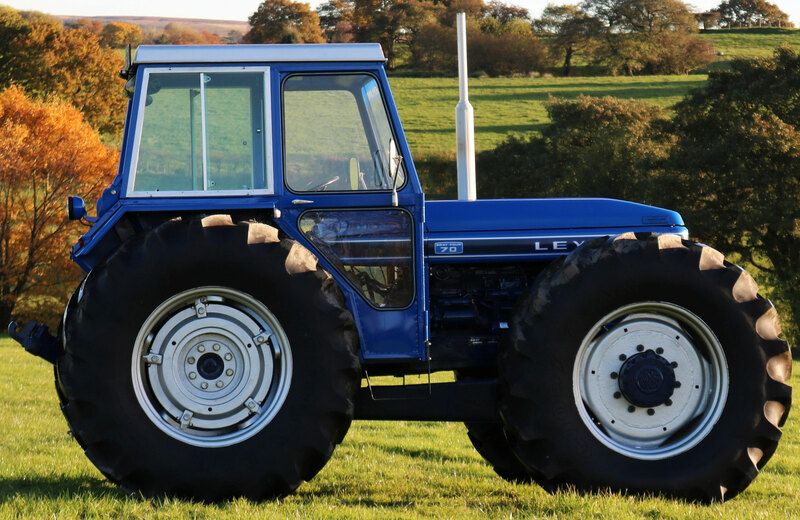 1973 Leyland Bray Four 70 – Total restoration project. Once severely damaged and considered beyond repair but rescued by Will and Dave from the scrapyard. The wreck was delivered to us on a pallet! All tinwork, engine, bearings, pistons etc were available off the shelf from our stores only the gears were made to special order. Leyland 270, 4/98NT engine. Power Assisted Variable Track (PAVT). Goodyear Super Tractor 18.4 R30 tyres. See more pictures of this tractor on our Instagram page @jcharnleyandsons. 1977 Leyland 184 (Leyland 235) - Original condition. 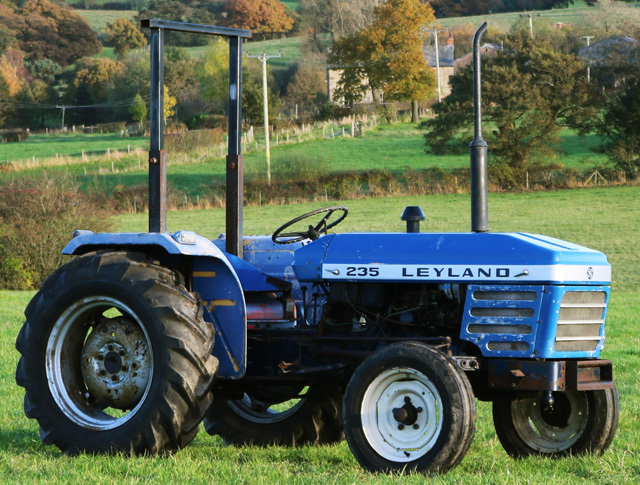 Between 1976 and 1977 two Leyland 184 prototype tractors were built at Bathgate using the 1800cc BMC diesel engine and built to the same styling as the rest of the Leyland range. The tractors were fitted with water temperature sensors and oil temperature sensors for testing. After all testing and restyling was completed the manufacturing rights were sold to Turkey where it was built and marketed as the Leyland 235. Charnleys bought both prototypes from Marshalls in 1980, one was kept for use on the farm and the other one was sold as a yard tractor to a local farmer. 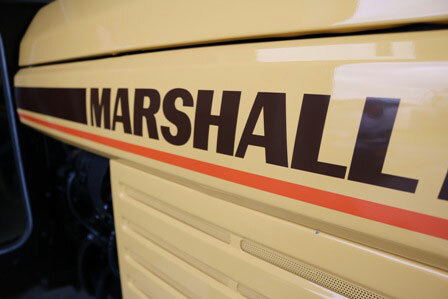 One of only two surviving Marshall 504 tractors from Marshall Sons & Co. Ltd. The second one is in the Museum of Lincolnshire Life. This tractor was originally bought by us in February 1986. It was a prototype tractor that had failed the “bump test” track at Britannia Works, Gainsborough. The bump test was basically a circular track of sleepers and tractors would be left running round and round over the bumps. The 504 prototype didn’t fare well; the front bolster failing and the front axle parting company with the engine! The tractor came in three sections: the front axle with wheels; the gearbox with engine; and the cab. When we rebuilt it the front engine frame and bolster were strengthened so it would not fail again. We originally intended to use the tractor on our farm, but considering that it is in virtually brand new condition, with only 12 hours on the clock, we decided to keep it unused here in the museum as an important part of the Marshall tractor history. 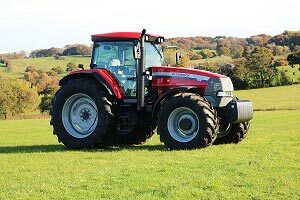 D3.152, 3 cylinder diesel engine; Max engine power 47bhp at 2250 rev/min; Max engine torque 128lb/ft at 1250 rev/min - Independent PTO gearbox, Max PTO power 40bhp at 655 PTO rev/min - Oil emersed brakes - Independant hydraulics, with one single acting valve and one double acting valve as standard - Lift capacity 3750lb (1700kg), Automatic pick-up hitch and Universal drawbar - Front weight frame -12-volt electric system - Tyres: 8.3 x 24 Front; 14.9 x 28 Rear. 1988 Marshall 854 - Original Condition. This completely original Marshall 854 has been serviced and maintained by us since it left the Marshall factory in 1988. 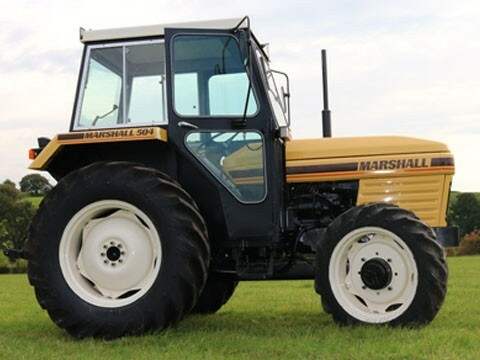 The first of only 18 Marshall 854 tractors ever made and the first of only 54 Marshall tractors to be powered by a Perkins 4 cylinder engine. It didn't begin it's life here in Brindle, it's first owner was Farmer Arthur Peel in the Yorkshire Dales. His farm was often used for filming of Emmerdale Farm and this tractor featured many times in the 1990's. 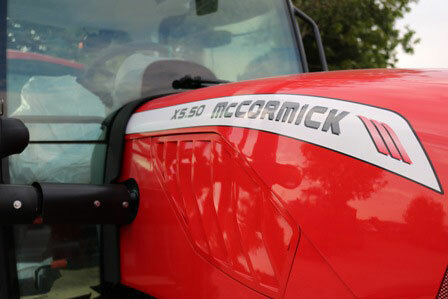 2008 McCormick XTX215E – The last Doncaster built tractor. This tractor was the last of 435836 tractors built at the McCormick factory in Doncaster. Bought by us on the 1st of September 2008 by “sealed bid tender”. The tractor serial number is JJE3501774 . It has the “E” Plus transmission. Large 650/65R42 Michelin Tyres, front axle suspension, cab suspension, 50kph transmission, heated mirrors and . . . .